A custom order baby quilt in pictures. I was asked to make a baby quilt for a yet to be born baby boy, and my instructions were "sew as you like". Okay, well that should be easy, right? I do like to sew without too much direction and patchwork sewing is how I like, but for some reason choosing fabrics and colors for a baby boy initially seemed so much harder than sewing for a baby girl. No pink, no pretties, no floral fabrics? 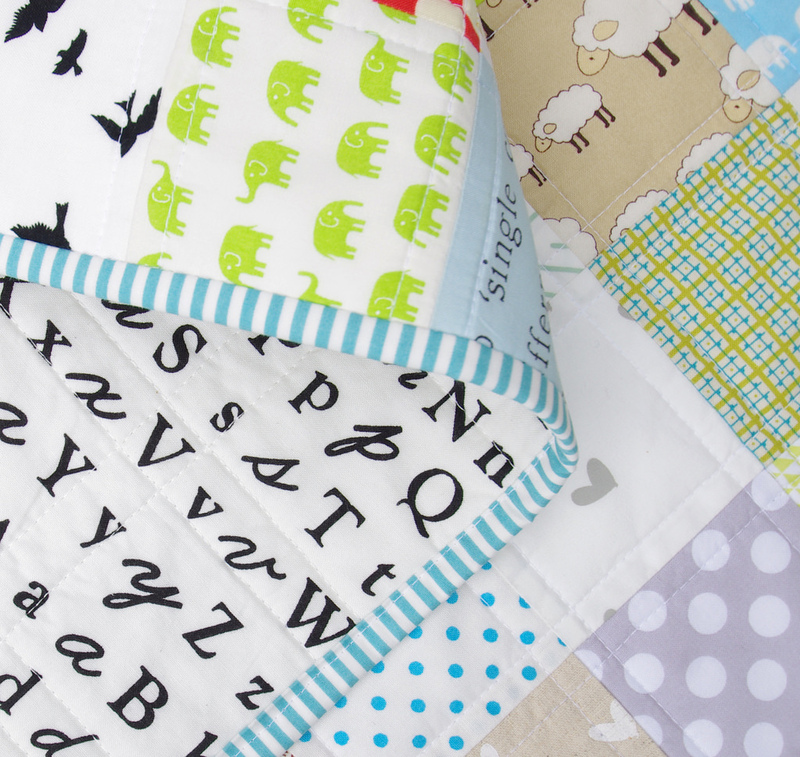 I rummaged through my fabric stash and pulled out some fun "I Spy" fabrics ~ elephants, whales, birds - as well as a range of stash basics in a blue/green color palette. I then added several of my recently acquired Maze and Vale hand printed fabrics ... and suddenly choosing baby boy fabrics wasn't that hard after all. There really are so many suitable boy fabrics right now, and as you can see I still did use several pretty floral prints. It all works. 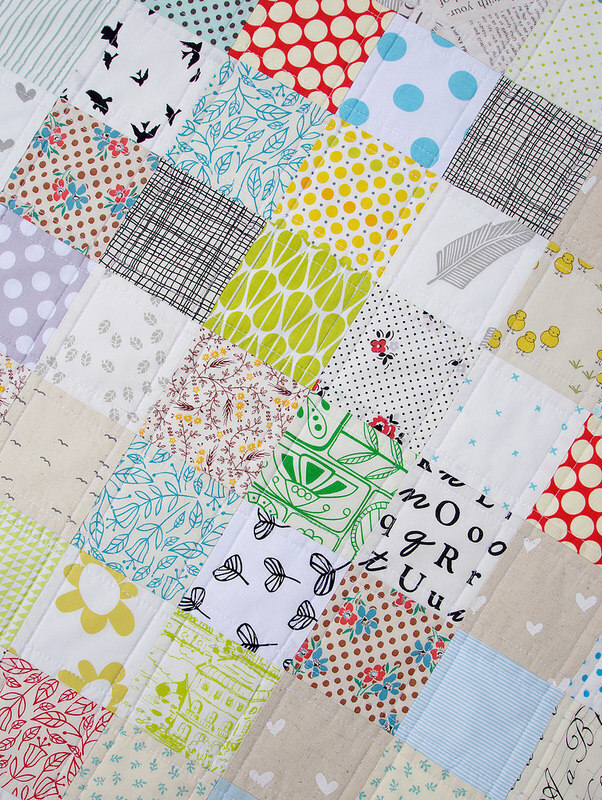 The quilt is fun, cheerful, and colorful, but in a quiet and understated way. For the back of the quilt I have used a black/white text fabric from the collection A is For by My KT. 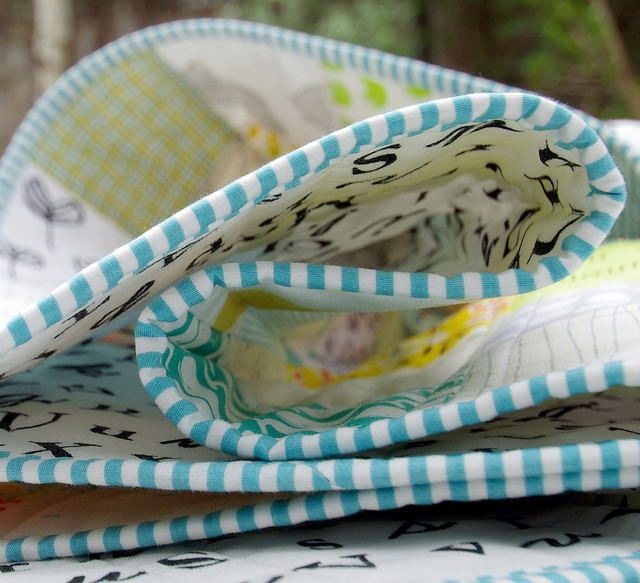 This fabric is just perfect for baby, toddler and kids quilts! 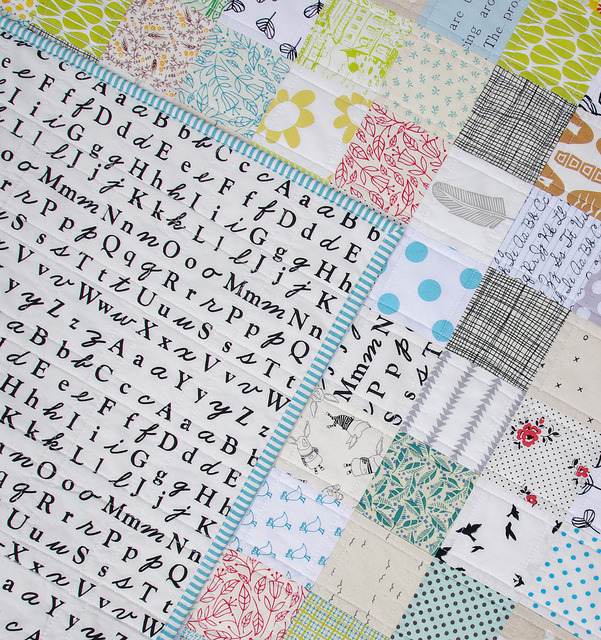 This baby quilt is now awaiting the arrival of a sweet baby boy. Any day now. It came out great!! I was issued a challenge to make a twin size quilt for a boy toddler that would STILL be appropriate for when he goes to university (she has a lot of confidence in quality, doesn't she?). Am having fun auditioning different ideas. Hope it comes out as nicely as your baby boy quilt! So beautiful! 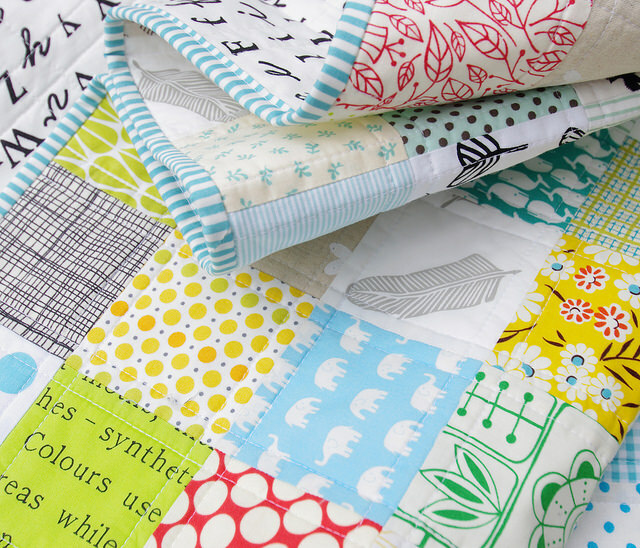 I have some Maze and Vale Fabrics in my stash too and I think I will use it in a quilt as well. Thank you for your Inspiration! I just love your blog. 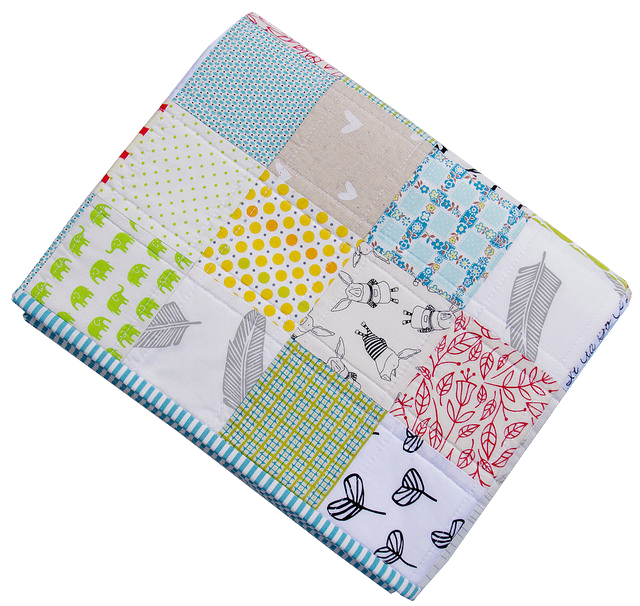 What a charming little quilt! 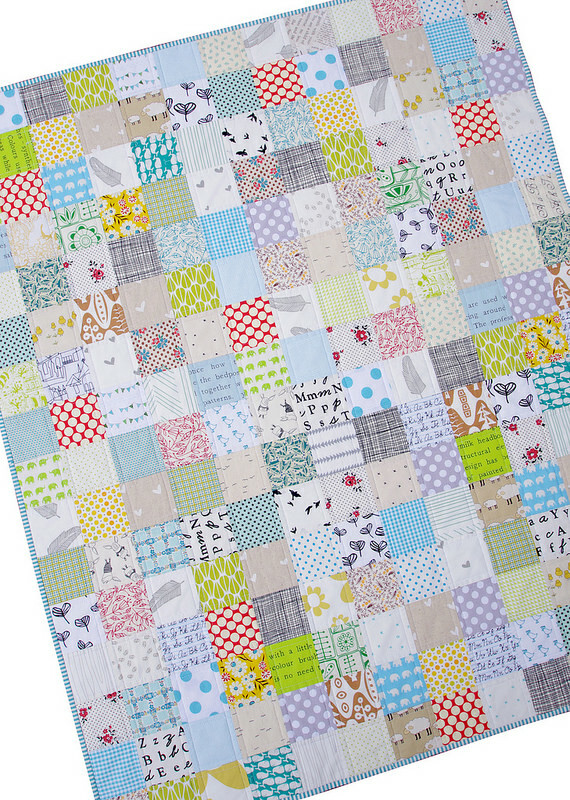 Love this baby quilt and your photo shoot is awesome!!! I have2 baby quilts to make and this idea would be perfect!!! Thanks! This is so sweet and just perfect for the new baby. I always love your quilts. You make every quilt look so polished and perfect. 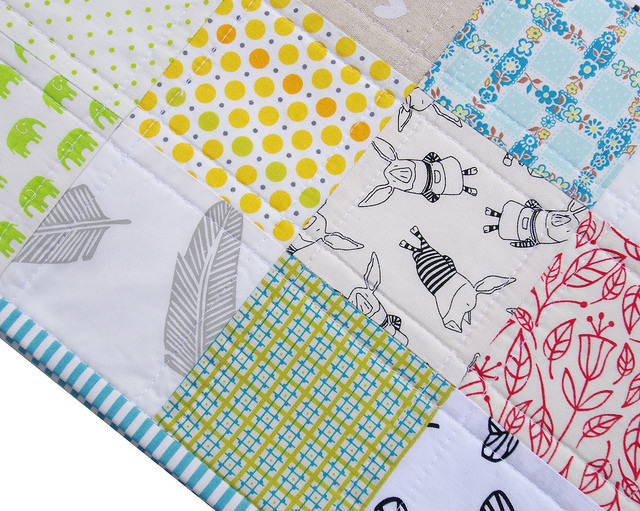 What sweet prints combined to make an adorable quilt! Bravo, great job! Such a sweet quilt. Perfect for a new bundle of joy! Great fabric choices, Rita. That is one lucky baby boy! The quilt is perfect! Beautiful! And perfect for a wee boy. Will have to keep this calming style in mind if I get another nephew in a month!! Beautiful quilt! I love the Pippa the pig fabric! I had made a couple of quilts several years ago for two little girls using fabric from that line, but I didn't have the fabric you used. I wish I would have had some! I will email you a picture the quilts I made. Isn't text fabric a boon to mankind. I love how it looks in a quilt. It somehow makes me think of a giant page from a book with the sleeper tucked between its pages. I really like the text fabric for the background. I love this!!!!!!!!!!! 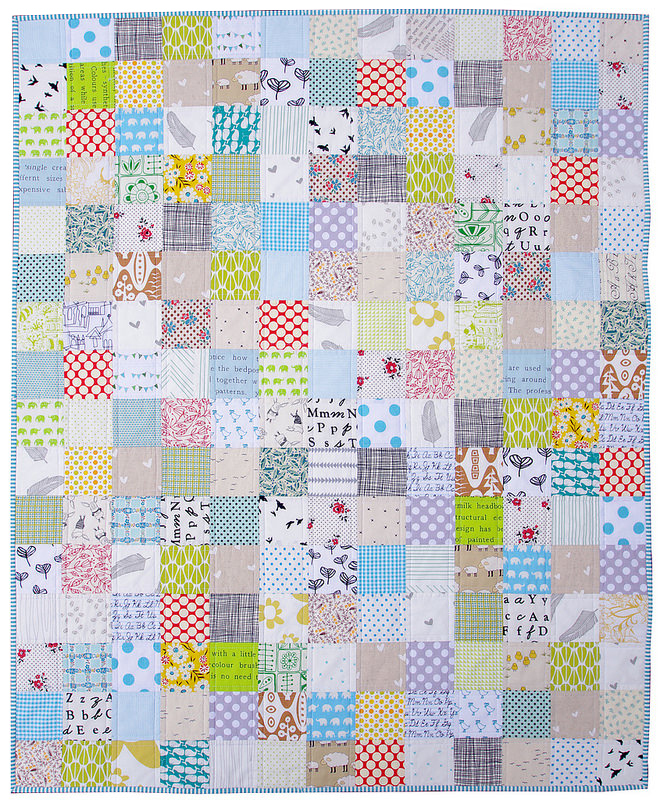 Your choices of patterns and colors is perfect on this boy quilt!!! Such a cute quilt. The I-spy never fails! Wonderful! The binding choice is the perfect finish!! Beautiful quilt! I love what someone above said about the text fabric being like a book page! Do you happen to have info on the flying birds fabric-- not Flight, but the other one in the 3rd picture? I know I've seen it before but I can't place it. thanks! Love the quilt. I really like the "pop of red" that you used as well. This little boy will love it as well. Very, very nice fabric choices. Love the overall effect. 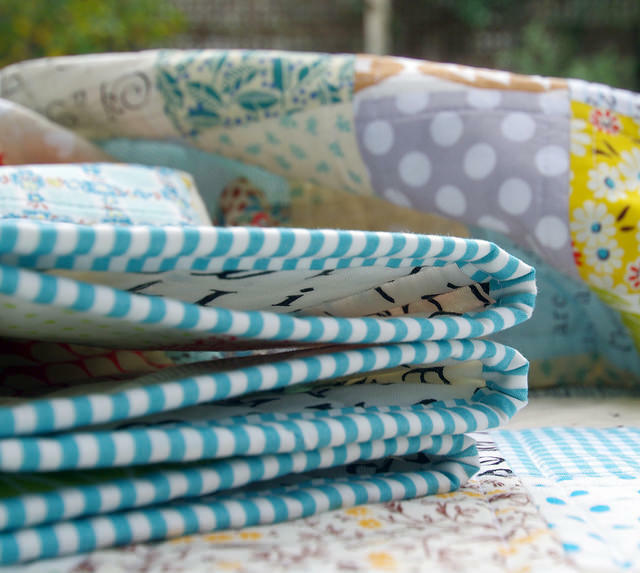 I just love your quilts ... and fabric choices! Your quilts always make me smile. This is a perfect boys quilt. Great job! You made an amazing quilt for a little boy! How adorable is this little boys quilt, I love it. You are so talented! I try to learn from each one of your quilts--putting colors and fabrics together is so much of an art. You definitely have the eye for it. And it is difficult to learn and do without that "eye." However it is much more fun than a formula. I just need to keep experimenting and trust my eye-- the inspiration comes from you! Thank you so much for sharing you gifts with us.